Drones, or unmanned remote-controlled aircraft, are well known for their deadly role in warfare. But in the past few years they have emerged on the domestic front in a variety of civilian applications, from firefighting and police surveillance to scientific research and aerial photography. 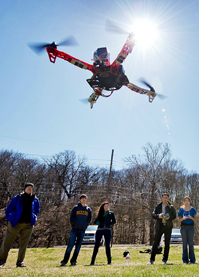 The growth of domestic drones has sparked excitement over their commercial potential. But drones have also prompted concern that they could violate personal privacy or pose safety hazards for other aircraft and for people on the ground. The Federal Aviation Administration is required to develop regulations to integrate unmanned aircraft into U.S. airspace by 2015. Meanwhile, drone advocates forecast that the industry's development could have a total nationwide economic impact of $82 billion from 2015–2025, with California, Washington state, Texas, Florida and Arizona benefiting the most.